Marjorie “Slim” Woodruff is a contributor to Writers on the Range, the opinion service of High Country News. She lives and works at the bottom of Grand Canyon National Park. Though someone I met on an outback trail once gave me the honorific of the “Leave No Trace Nazi,” I prefer the kinder title of “High Priestess of Leave No Trace.” It allows for a less punitive ambiance. What’s more, a priestess may confer benefits as well as smite wrongdoers. The High Priestess is not pleased when she is confronted with cigarette butts, facial tissue, disposable water bottles (even those tied in a cute little knot), gooey energy-gel packets and their attendant tabs, or orange peels and apple cores. She wonders: Would these discards be welcome in the perpetrator’s living room? And is not wilderness the living room for its full-time residents? A High Priestess’ work is never done, and so with a sigh and ancient curses muttered under her breath (and sometimes above it) she picks it all up. Wrappers, bottle tops (what happened to the bottle? ), eggshells, plastic bags. More esoteric objects have included snowmobile boots, two full-size inflatable beds (at 9 pounds each) and a car door. Gummy energy packets and cigarette butts are the worst. They are sticky and stinky, respectively. Orange peels at least make the trash bag smell nice. And no, though you keep trying not to know this, orange peels do not biodegrade quickly; it can take them up to two years to do so, in fact. The High Priestess would appreciate the work of Packing It Out, a team of hikers who pick up trash on their hikes. 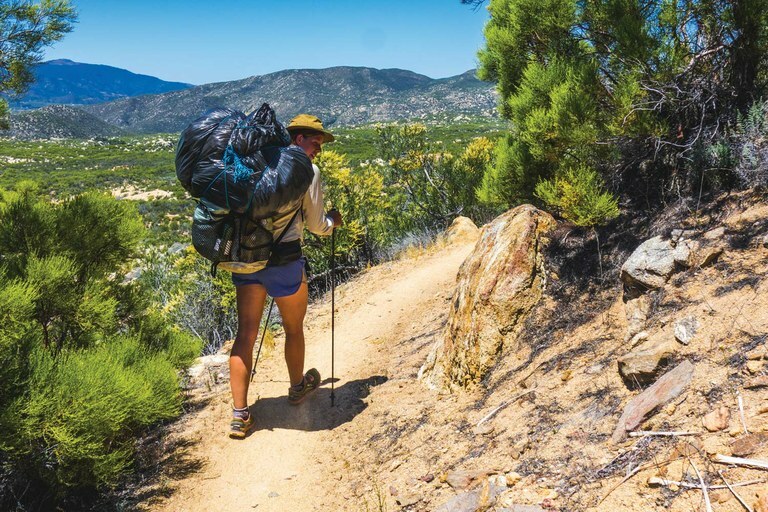 During a trip on the Pacific Crest Trail in 2016, they packed out more than 720 pounds of trash. Once, along the trail, the High Priestess found an electrolyte-replacement bottle lying in full view, now filled with mud. The Priestess emptied it and left it to dry in the sun, intending to pick it up on the way out. Upon returning, she found that it had been joined by three single-use water bottles. Apparently this had become the home of disposable plastic bottles en route to their final resting place in the ocean. Seriously, people? You are supposed to be hikers! Buy a canteen! Illegal campfires require their own etiquette. Also legal ones, if their creators are not following the principles of Leave No Trace. Sadly, it is not enough to just scatter the rocks. One must also clean out the trash, scatter, bury or carry out the charcoal and then camouflage the area. There was a time in Zion National Park when a couple was sighted tempting a squirrel with an apple. The animal grabbed the fruit and ran. The Priestess vaulted over a rock wall, snatched the apple out of the squirrel’s surprised maw, and turned to the couple. “Perhaps,” she said, “you didn’t notice the sign RIGHT THERE which says do not feed the wildlife?” This might have seemed just a bit overzealous to the tourists. Graffiti is exploding in the national parks. Perhaps because increased visitation leads to increased numbers of people With No Clue. Perhaps because social media allows these vandals to share their “art” with the world. Such antics are unsightly, but more importantly, they encourage the easily led mob to add their own decorations. Most of the time a squirt-bottle full of water and a stiff brush takes care of the problem (the graffiti, not the artists). Cutting switchbacks destroys trails and can cause rockslides. A few years back, a hiker had to be air-evacuated from a Grand Canyon trail when short-cutters above him dislodged rocks that landed on his cranium with consequent ill effects. After a few reminders that this behavior is unsafe and irresponsible, the Priestess pulls out a phone and informs the perps that Park Dispatch has received a video of their malfeasance. There is no Wi-Fi on the trail, of course, but do they really need to know that? Occasionally, a miscreant is caught in the act of littering. The Priestess then is all sympathy. “If you are too weak and exhausted to carry out this used facial tissue, perhaps I should call for rescue immediately!” This usually evokes a blank stare, or an occasional look of indignation, but it amuses the Priestess. Even if the Priestess does not smite, perhaps Ma Nature will. There is, after all, such a thing as Karma. Treat the wilderness like a trash heap, and it may come back to bite you. Those of us who pick up after others are often rewarded with fine weather, the best campsite, or just plain good luck. Those who trash the place may be rained out, or refused a permit. Bad luck may stalk them all their days on the trail. Malevolent spirits will plague them. Mother Nature bats last.